If you've read this blog for any length of time, you'll know that Romance is not my favorite genre. 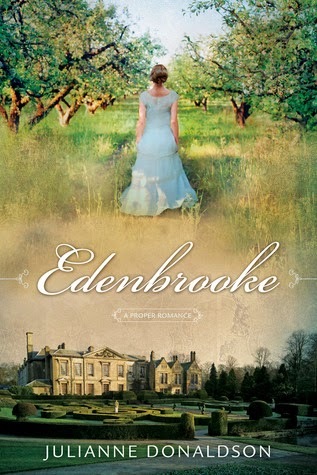 But I will say that Julianne Donaldson's romance novels are the least objectionable I can recall reading and I like Edenbrooke best. In Edenbrooke, our heroine, Marianne, is still grieving the death of her mother in a riding accident a couple of years ago. Her father sent her to live with an aunt in Bath and her twin sister Cecily to live with relatives in London, while he took off for a small town life in France. Marianne misses them both dreadfully and is painfully bored with life in Bath. When she receives an invitation from her sister to join her at the grand country estate of a friend of their mother's, she jumps at the chance. Of course, the family that owns the estate includes a handsome, brooding son, Philip. For a week on the estate before Cecily arrives, Marianne and Philip spend a great deal of time together, riding, bantering, playing chess, enjoying the library. A great friendship develops between them until others arrive to throw wrenches into the works. The book includes several to-be-expected plot devices - the persistent and undesirable suitor, the catty and superficial rivals, the unfortunate misunderstandings and jumping to conclusions - but Marianne is a very likable protagonist. She's young and sympathetic, genuine and loyal almost to a fault, intelligent (and well-off) without taking herself too seriously. One delightful scene involves her pretending to be a dairy maid and singing an impromptu song that she would sing to the cows while milking and her lack of pretension is absolutely endearing. I thought the beginning of the book stronger than the ending. There were several extremely convenient conversations or events in the last few chapters that made it feel somewhat rushed and just too neat. The relationship between the sisters seemed particularly odd to me, even a bit dysfunctional. Of course, sisters - even twins - can grow apart over time, but their characters were so diametrically opposite and Cecily seemed so oblivious and even callous toward Marianne, when Marianne was so solicitous and loyal to Cecily, that it was hard to find any redeeming qualities in her. (I actually wrote down in my notes at one point while reading, "Cecily is insufferable!") And then there's such an about face at the end I almost got whiplash. But on the whole, Edenbrooke is at the top of the list for romance novels I've read. I'm sure it would be a favorite for those who like this genre.